The JES Comfort Buddy is not only practical and therapeutic but also decorative. Handmade in the U.S.A. The comfort buddy wraps you in herbal hot or cold relaxation therapy providing relief for aches and pains, cramps, stiff joints, stiff neck, muscle spasms, as well as relief of the symptoms from fibromyalgia and arthritis, back pain due to pregnancy, and achy knees and hips. These all-natural heating pads are also excellent for pre-warming your bed, or placing on your lap or around your shoulders for that little extra bit of warmth on a chilly day or cold night. The eye/sinus comfort buddy is great for opening up your nasal passages and aiding in sinus drainage, great for anyone that suffers with restless sleep, headaches, under eye circles or puffiness, eye pain, fatigue or fever. 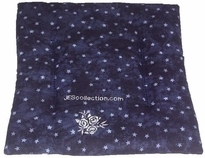 JES comfort buddy herbal relaxation wraps and pillows can be either heated in the microwave for heat therapy or can be placed in the freezer for cold therapy. 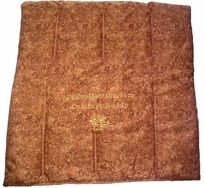 JES comfort buddy herbal relaxation pillows are filled with flax-seeds and a therapeutic blend of herbs to help with pain and relaxation(herbs are optional). Choice of 100% Cotton or Cotton Flannel.